Minot State University is not responsible for providing computers, Internet access, or software for students taking online courses. It is your responsibility as an online student to have access to a computer, Internet Service Provider, and the appropriate software (if required) to complete your online course. The technical requirements for your computer are listed below. Some online courses have additional requirements such as software or test proctors. These requirements are listed on the Schedules page prior to each semester. 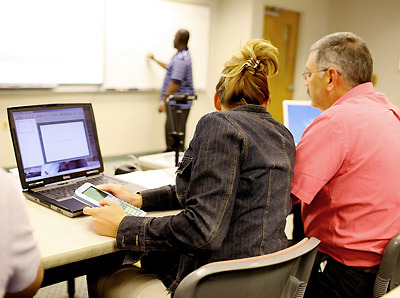 It is important that you have a computer system that can adequately support your online courses. You will need to have access to a computer system that meets the following minimum technical requirements. Planned, regular maintenance is also required and part of your ongoing responsibility to maintain access. Some businesses and institutions such as the military or education, do not give user's administrative access to computers. You will need administrative access to your computer in order to make sure it is compatible. Internet service provider (ISP) account with a wired connection. You will be able to complete some functions with a wireless connection, but others will require a wired connection. We highly recommend a wired connection for the following functions: using Respondus LockDown Browser, SafeAssign, Collaborate, and Tegrity. You cannot successfully complete an online course using only an iPad, iPhone, Android device, or tablet even if you are using the mobile app. The mobile app will only allow you to perform certain functions NOT complete an entire course. We recommend that you have at least two browser downloaded. If you have problems in one, you can use the other to see if the problem is related to your browser or browser version. Most new MACs are not shipped with Adobe Flash. So the user must download the software. This may affect the speed of your computer. Automatic Updates need to be set to check for updates but let you choose whether to download and install them. Before installing any browsers or service packs, make sure they are compatible with Blackboard. A malicious software detection tool that can be run weekly. Office 365 ProPlus is available for currently enrolled students. Some online courses have multimedia that requires software that is available as a free download if you follow our instructions. The schedules page will tell you what software is needed for each course. You can wait to download the plug-ins because not all are required for every course. Downloading only the required plug-ins will save space on your hard drive. Online students are required to have virus software and to keep it current. Computer viruses are major problems to the online experience. Their effects range from inconvenient to catastrophic. In an online learning environment, where file attachments are often shared, viruses have a good opportunity to proliferate. At MSU it is our policy to take every precaution to guard against viruses. You can take steps to minimize your chances of infections by being careful of what you download, open only attachments you know are safe, keep your anti-virus program updated, install all updates, and install a spyware program and run it on a weekly basis (i.e. Ad-Aware). The Federal Trade Commission web site has some tips to help protect your computer from all types of malware. A list of low-cost or free antivirus and malware options is available on the MSU IT Central Software Downloads page.